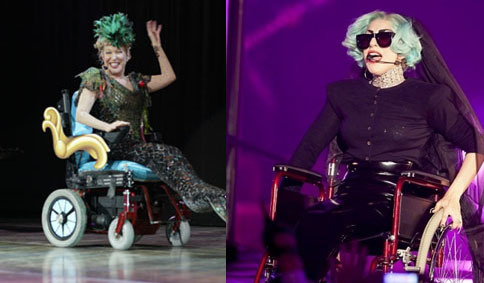 Lately, it has come to the media attention an interesting war between two generations of artists: actress Bette Midler and pop artist Lady Gaga fight over the mermaid in wheelchair routine that both have performed…only Bette Midler has done it first, according to her Twitter comments. On July 15, following Lady Gaga’s performance of the mermaid in wheelchair routine, famous actress Bette Midler has written the pop icon a message bringing to her attention that the act was initially performed by her, and therefore she has the author rights of the performance. “I’m not sure @ladygaga knows that I’ve performed my mermaid in a wheelchair for millions of people — and many of them are still alive …” the actress wrote. Gaga did not send any comments back on the matter. Her Twitter has put on the first place the recent visit to Howard Stern and the promotion of the eccentric performer’s new album. Previous ArticleTeenager dies after being caught in Lamar Odom’s car accidentNext ArticleGoodbye to Apple’s White MacBook?